In August, Not The Barnet Times reported how greedy councillor Melvin Cohen was being granted a new allowance of £7,480.50 for chairing just four meetings of the Constitutional Review Committee - a task which previous chairmen had performed at no cost to taxpayers. Councillors are quick to claim they deserve all these allowances because of their heavy workloads. 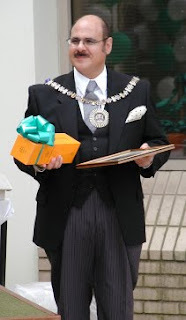 Well thanks to Melvin, that load is about to get a little bit lighter because he is proposing to scrap the rule which requires important documents to be sealed and executed by either the Mayor, Deputy Mayor or Leader of the Council, all of whom are elected councillors. Instead the unelected and unaccountable Director of Corporate Governance, Head of Legal or Democratic Services Manager will be authorised to sign instead. The public should be in no doubt that this is not a minor piece of procedural housekeeping, but a major constitutional change. At the present time, all documents must be sealed by an elected councillor with the exception that the Chief Executive is permitted to sign only if the Mayor, Deputy Mayor or Leader are all unavailable. But Melvin Cohen’s proposals would allow officers to sign documents in place of councillors. Thanks to the Local Government Act 2000, unelected officers already have the power to take major decisions involving hundreds of thousands of Pounds of public money, without requiring the prior approval of elected councillors. If Melvin Cohen’s proposals are approved, councillors will effectively become redundant, and will have nothing to do all day except count their allowances.